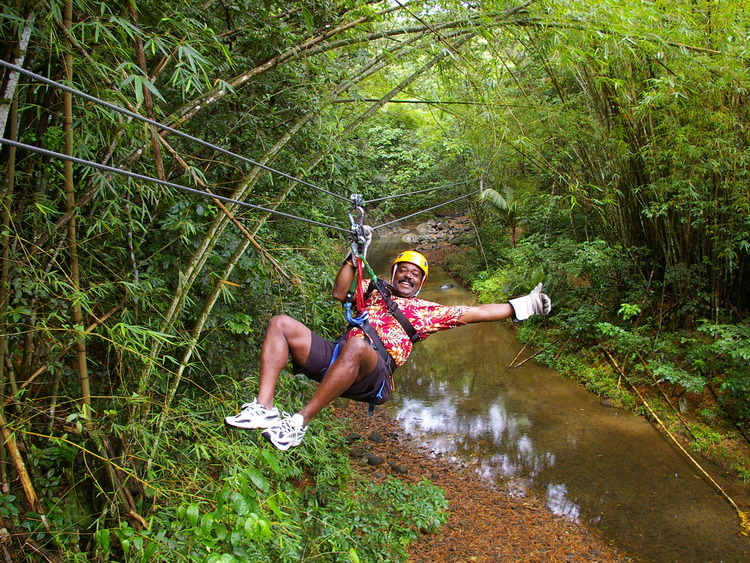 There is nothing better than visiting the wonderful St. Lucia ecosystem while hanging from a zipline. An adventurous excursion with an adrenaline rush to discover the rain forest and the wonderful St. Lucia scenery the sight of which will leave us breathless. Our adventure starts as soon as we get off the ship as, after crossing a panoramic valley, we continue along the eastern coast as far as our base in the middle of the rain forest on the Errard estate. Once there, we are given instructions and safety equipment such as harness, helmet and gloves: we are now ready to jump into our zipline adventure and experiment the adrenaline rush of flying through one of the most amazing corners of the island - the rain forest, with its tropical flora and fauna. The excursion includes 10 elements made up of 12 ziplines. The longest is located at a height of 243 metres and platforms are maximum 45.45 metres from the ground. There are also two rain bridges extending to 18.18 metres. In both cases, expert guides will assist us and provide information on the different areas of the ecosystem as well as guarantee our safety when passing from one platform to the next. Securely fastened harness and helmet must be worn. We recommend bringing insect repellent and a small bumbag, sun cream and a small backpack to store personal items; hands must be kept free throughout the activity.